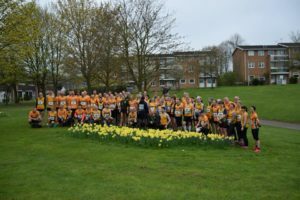 A huge mob of approximately 134 Striders turned out for the Dronfield 10k, which forms part of this year’s Road Race Championship. The race was won in 34:12 by our own Liam Walker, closely followed in second by Phil Skelton, with Joe Sweetnam-Powell, Stuart Carrack and Robert Bishop also in the top 10. First female was Rachael Lundgren of Hallamshire Harriers. Heather Hatton and Fran Cummins of the Striders were in the top 10 females. Stephanie Street won the F60+ category for Striders. Paul Stuart won M50-59. Other category top 10s went to… Kim Bateman, Sarah Allcard, Julie Bembridge, Caroline Greenough, Claire Johnson, Kate Scott, Catherine McKeown, Joanna Carnie, Caroline Welton, Helen Eberlin, Sheena Woodhead, Conor O’Boyle, Jordan Moat, Paul Middlemas, James Story, Matt Rimmer, Jason Brannan, Paddy Treehowes, Mark Platton and Steve Irvine.